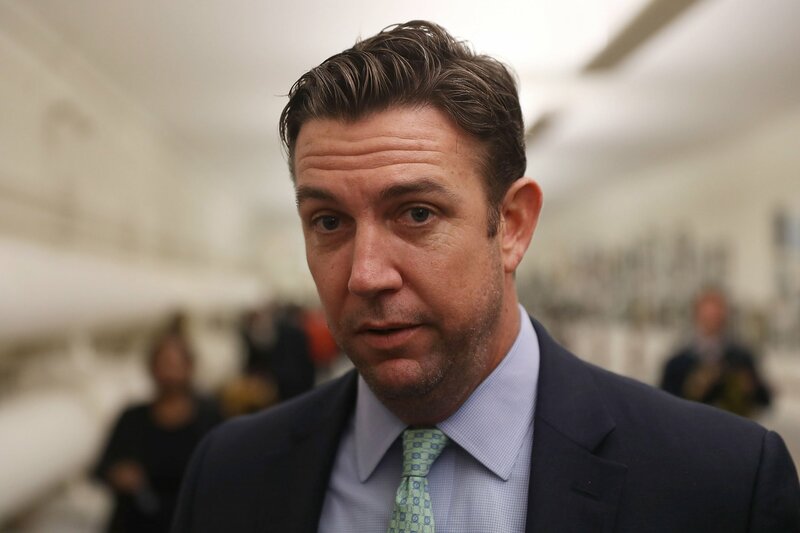 Republican Congressman Duncan Hunter, the California lawmaker indicted last year on 60 counts by a federal grand jury for allegedly misusing $250,000 in campaign funds, is again issuing campaign attacks that are anti-Muslim and racist, Democrats say. In a campaign email sent this week to his supporters, Hunter alleged his Democratic opponent, Ammar Campa-Najjar, would be a "grave threat to our national security if ever elected!" He also suggested the San Diego native has ties to his Palestinian grandfather, Muhammad Youssef al-Najjar, one of the men responsible for the 1972 Munich Olympics terrorist attack that left 11 Israeli athletes and coaches dead, along with one police officer. Campa-Najjar’s grandfather died 16 years before he was born, and the congressional candidate has condemned the terrorist attack. Campa-Najjar, a Christian, Palestinian Mexican American, is calling the renewed attacks an “act of desperation,” while other California Democrats have labeled Hunter’s remarks as bigoted. Hunter served two combat tours in Iraq and a third tour in Afghanistan, joining the Marine Corps after the September 11, 2001, terrorist attacks. Sitting members of Congress from California have come to the defense of Campa-Najjar, who worked for the Department of Labor during the Obama administration and had a government security clearance as recent as 2016. “Congressman Hunter ran a bigoted and deeply offensive campaign against Ammar Campa-Najjar in 2018 when he narrowly won re-election while under indictment, and it appears he is picking up right where he left off," Congressman Adam Schiff told Newsweek in a statement. The California lawmaker whose district covers parts of Los Angeles County is head of the House Intelligence Committee, a panel that regularly receives classified briefings and documents from members of the intelligence community. “The smears on Ammar, who was born and raised in California and has a distinguished record of public service, are despicable and should be rejected and called out by members of both parties," Schiff added. 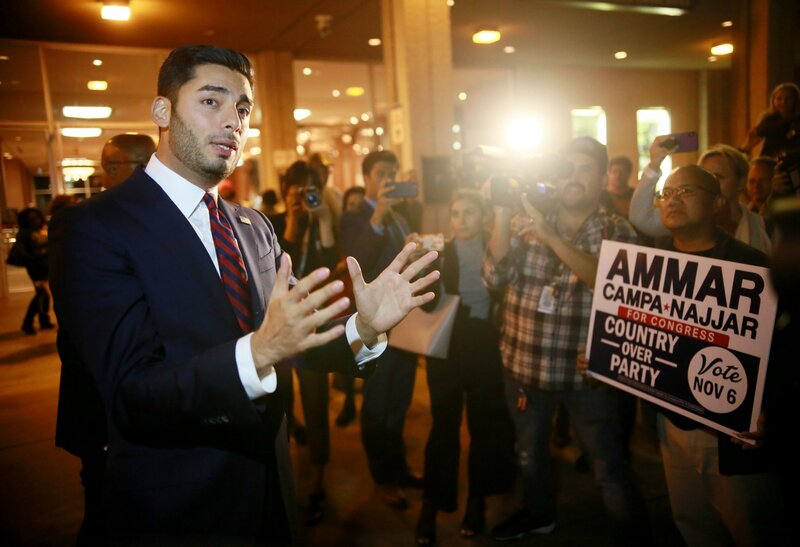 In his campaign email, Hunter said that Campa-Najjar has changed his name from Ammar Yasser Najjar and the name of his campaign committee “to shield his true identity.” Previously, Hunter also said the reason was “so he sounds Hispanic” and for Campa-Najjar to disassociate himself with his grandfather. Speaking to Newsweek last year, Campa-Najjar explained he has long used his mother’s maiden name and that his Labor Department certificate also bore the name Ammar Campa-Najjar. Hunter’s office did not respond to Newsweek’s request for an interview. He and his wife, Margaret Hunter, were indicted for conspiracy, wire fraud, falsification of records, prohibited use of campaign contributions and aiding and abetting in connection to the $250,000 in campaign funds that prosecutors say they spent on personal vacations, tequila and video games. The pair has pleaded not guilty and have a September 10 trial date. Despite the charges, Hunter surged forward with his campaign and won re-election last year. He blamed the charges on "leftist government folks" and, in part, his wife, who he said was the campaign manager and handled the finances. With more time and resources, in addition to renewed optimism, Campa-Najjar has already been campaigning for months for the 2020 election. In the first quarter of 2019, the Democrat raised more than $350,000, eclipsing the less than $8,000 he raised during the first quarter of his previous campaign, according to filings with the Federal Election Commission. This time around, Campa-Najjar said focusing more on grassroots campaigning will hopefully aid him in unseating six-term Congressman Hunter.